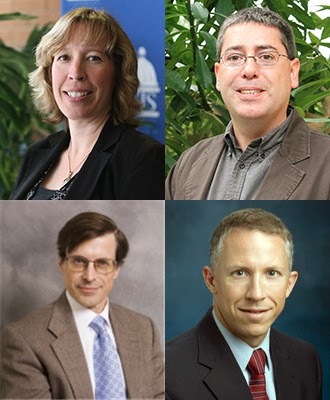 Four faculty members from the University of Illinois Springfield and the Southern Illinois University School of Medicine have been awarded inaugural grants from the Caryl Towsley Moy, Ph.D., Endowed Fund for Collaborative Research. Richard Moy, M.D. (1931-2013), former dean of the SIU School of Medicine, and his sons Philip and Eric Moy created the $250,000 endowed fund at UIS in honor of their wife and mother, former professor Caryl Moy (1932-2010). The fund supports faculty from UIS and the SIU School of Medicine who do team-based research. Caryl Moy taught for 21 years at UIS (then Sangamon State University) beginning in 1970. She also served as a clinical professor at the SIU Medical School. Karen Reinke, Ph.D., UIS associate professor of psychology and Jeffrey I. Bennett, M.D., SIU assistant professor of clinical psychiatry, will be examining whether electroencephalography (EEG) can help predict the success of transcranial magnetic stimulation (TMS) treatment in adults with major depressive disorder. They also will examine the kinds of changes that take place in the brain during TMS treatment that correspond with improvement in depression. Wiley Jenkins, Ph.D., SIU associate professor and science director for the Population Science Program, and Dennis Ruez, Jr., Ph.D., UIS associate professor of environmental studies, will use geographic information system technology to investigate potential associations among occurrences of various kinds of cancers, coal mining activity, and arsenic in drinking water.